Cocaine hydrochloride is a central nervous system stimulant derived from the coca plant. There are basically two chemical forms of cocaine: the hydrochloride salt and the "freebase." The hydrochloride salt, or powdered form of cocaine, dissolves in water and, when abused, can be taken intravenously (by vein) or intranasally (in the nose). Freebase refers to a compound that has not been neutralized by an acid to make the hydrochloride salt. The freebase form of cocaine is smokable. Abused for the intoxicating effects, cocaine interferes with the reabsorption process of dopamine, a chemical messenger in the brain responsible for controlling pleasure, alertness, and movement. 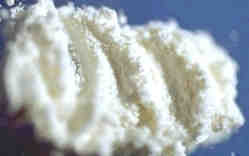 Cocaine also has topical anesthetic properties which do not cause intoxication. In Texas, cocaine is the primary illicit drug of abuse reported by adults entering chemical dependency treatment. How long has cocaine been used? The Incas were probably the first to use cocaine 5,000 years ago, but the cocaine that we are familiar with today was first refined by a German chemist in 1858. In its concentrated, purified form, cocaine was used in various medications and led to the first major epidemic of cocaine abuse around around 1900. Soon after, restrictions were placed on the drug because of adverse side effects and addictive properties. Today, cocaine is classified as a Schedule 2 Controlled Substance under the federal Controlled Substances Act and is illegal in most circumstances. Why do people use cocaine? Individuals may use cocaine for the exhilarating high, increased energy, and improved confidence. They may also seek the approval of their peers, stress reduction, or rebellion against authority. What they do not realize is that cocaine use can disrupt the chemical balance in the brain, depleting the "feel good" chemicals the brain needs to function normally after the "high" wears off. That's why users experience fatigue and depression or "crash" after the intoxicating effects subside. How long does cocaine remain in the body? Benzoylecognine, a metabolite unique to cocaine, can be detected in the urine 2-4 days. The disruption to brain chemistry can remain for much longer. Individuals who have become dependent on cocaine will feel intense cravings for cocaine long after use has ceased making recovery difficult. Yes. Pregnant cocaine users risk miscarriages, severe hemorrhaging, premature births, and stillbirths. Infants who do survive are not only born premature with smaller than average heads, but also they are smaller in size than their peers and may exhibit withdrawal symptoms. Crack babies may have developmental difficulties as they grow older.